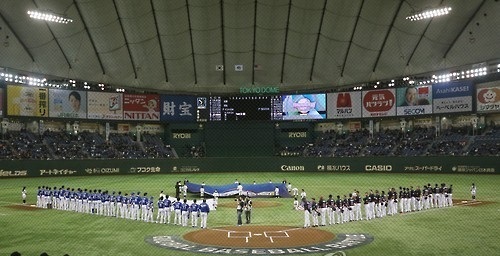 The inaugural Asian professional baseball tournament will start this fall with a showdown between archrivals South Korea and Japan. The Korea Baseball Organization on Monday released the schedules for the Asia Professional Baseball Championship, which will be played from Nov. 16 to 19 at Tokyo Dome. It will feature players from professional leagues in South Korea, Japan and Chinese Taipei. The opener will pit South Korea against Japan on Nov. 16. South Korea will then face Chinese Taipei the following day. Japan will play Chinese Taipei on Nov. 18. Then on the final day of the competition, the two best teams after the round robin play will face each other to determine the champion. Starting times for all games will be announced later. The KBO, Nippon Professional Baseball and the Chinese Professional Baseball League agreed on the event in January. The tournament is open to players under age 24 -- born on or after Jan. 1, 1993 -- or those with under three years of professional experience. Teams can each select up to three players over the age or experience limit. Unlike in some international tournaments, there are no pitch count limits and no mercy rule will be in effect. Teams will have designated hitters. If teams are tied after nine innings, the team batting in the top of the 10th will have runners at first and second to start the frame.